In games with multiple equilibria, different equilibrium selection criteria have been proposed. Payoff-based equilibrium selection criteria include payoff dominance and risk dominance, whereas focal points based on salient features are non-payoff based criteria. This paper examines how the presence of a cultural focal point interacts with payoff-based selection criteria. Empirically, we consider pay-as-bid Treasury bill auctions in which multiple equilibria arise (specifically a stag hunt game). We find that market-clearing bids (submitted as discount rates) more frequently end in a round number of 0 and less frequently end with a 9 than would otherwise be expected. In contrast, the frequency of bids ending with a final digit of 1 is not significantly different from a uniform distribution. We argue a round-number focal point interacts with payoff dominance and risk dominance in an asymmetric manner. 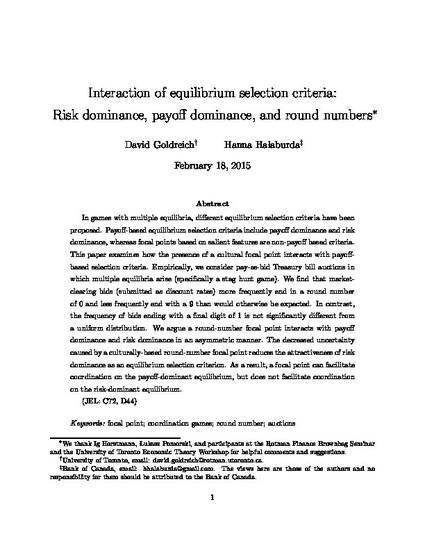 The decreased uncertainty caused by a culturally-based round-number focal point reduces the attractiveness of risk dominance as an equilibrium selection criterion. As a result, a focal point can facilitate coordination on the payoff-dominant equilibrium, but does not facilitate coordination on the risk-dominant equilibrium.